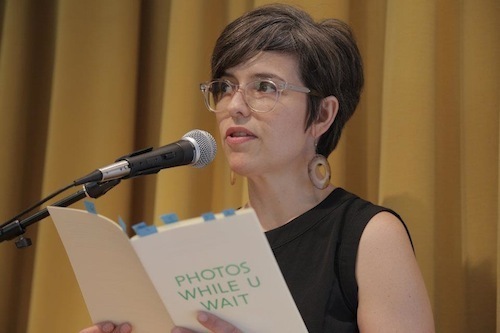 Mónica de la Torre, a current Lannan poet-in-residence, was born and raised in Mexico City. She is the author of four poetry collections, two in Spanish and two in English. De la Torre’s latest collection, Happy End, was published in 2014. Publishers Weekly described her 2008 collection of poems, Public Domain, as a “hilarious, deeply cynical” interrogation of “language public and private.” De la Torre has translated numerous Latin American poets, including Gerardo Deniz and Lila Zemborain, and she has edited for the Brooklyn Rail. Recently, her work has been published in Aufgabe, Convolution, frieze, the catalog for the exhibition Xul Solar and Jorge Luis Borges: The Art of Friendship, and Triple Canopy’s Corrected Slogans. She is BOMB Magazine‘s senior editor. On Saturday, September 27th at 6 PM, de la Torre will read at the Marfa Book Company. This entry was posted in and tagged BOMB Magazine, Lannan Foundation, Mexico City, Monica de la Torre, poet-in-residence, Public Domain. Bookmark the permalink.